What is the profile checklist? Where and how will my Featured Images be displayed? How do I claim my page? How do I unclaim a page? Claiming your page is an important step no matter what your role is in the industry. For Talent: Claim your page to showcase your talent on IMDb, IMDbPro, and Prime Video. You can upload images, set your primary image, select which images are featured across IMDb and Prime Video, select which credits you are best Known For, upload demo reels, and more. Use IMDbPro to showcase yourself to hundreds of millions of fans and industry insiders that visit IMDb and Prime Video every month. For Filmmakers and Crew: Claim your page to add guild affiliation and employment details, select your Known For credits, and add contact and representation info. Casting Directors: Claim your page to manage your Known For credits, and add contact and representation info. Talent Representatives, Studios, and Production Companies: Claim your page to maintain your client roster and staff information and keep your contact details current. 2. 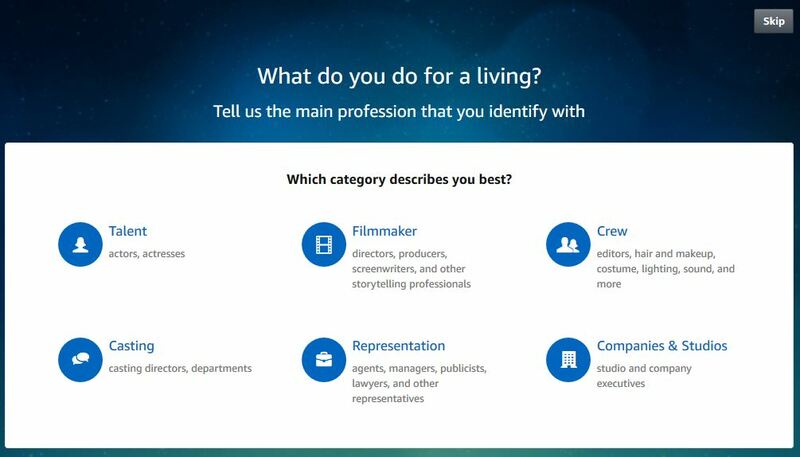 Select the category that describes you best, then your primary profession (i.e. Actress, Director, Production Designer, etc. ), and select "Continue". If your primary profession is not listed, or if you prefer to skip this step, please select "Skip this step". 3. "Your professional name" will be pre-populated to search for your IMDb page. If your professional name is different from your account name, please select "Change Name". You should enter the name exactly as it appears on IMDb. Click "Search" and you'll see a list of names matching the text you have entered. 4. If you have an IMDb page, select "Claim Page" to the right of the page in the search results (even if the name is outdated or misspelled -- for additional help, please see: How do I change my name?). If you don't already have an IMDb page, select "Create New Page". Before selecting this option, please make sure that you are not already listed on IMDb (i.e. under a different spelling or an old variant of your name), otherwise this will create a duplicate IMDb page. If you have already claimed a page, but need to start the process over (for example, if you accidentally claimed the wrong page), you can unclaim the page via your Page Controls by selecting "Unclaim this page". WARNING: this will sever the connection between your membership and your claimed name page, and will erase all IMDbPro-exclusive information and images uploaded to the page via IMDbPro. Use with caution -- once unlinked, this data is not recoverable. If you are certain you didn't create the membership claiming your page and you're unable to determine who did, please visit the Contact Us page while logged into your IMDbPro account and select IMDbPro member questions > Claim your IMDb page (if you are logged out of your IMDbPro account, please select IMDbPro member questions > Other IMDbPro member issues), then select "Email" and let us know how we can help. For more information on how to get the most of your IMDbPro membership, please see our Pro Tips.